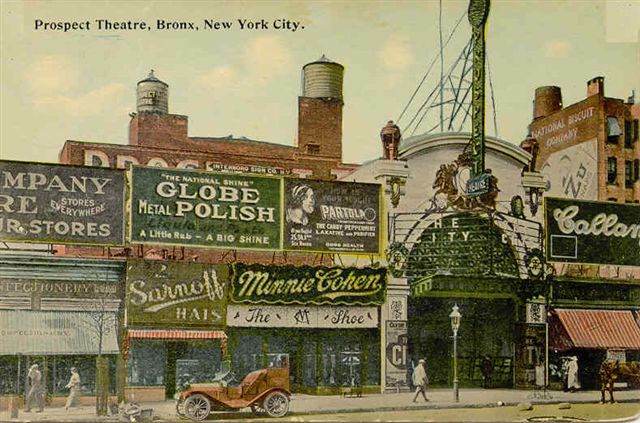 This vacant building was originally the Prospect Theatre, a vaudeville house that opened in 1910 (postcard image) with a seating capacity of 1,600 (interior photo). 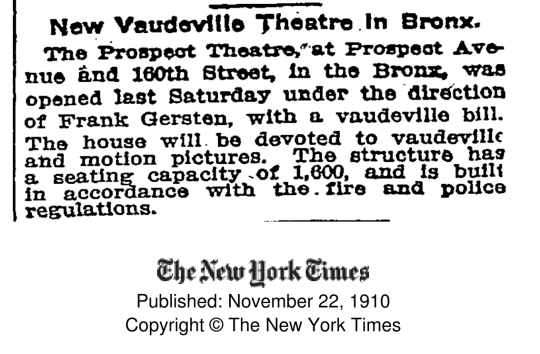 Looking through the NY Times archive, I can see that the Prospect was primarily staging Yiddish plays by 1925, and continued to do so until at least late 1934. Based on this photo, I would guess that the theater became a movie house in late '34 or '35 (Twentieth Century was released in '34). A couple of commenters on cinematreasures.org say they remember watching Spanish-language films here between the late '50s and late '60s. 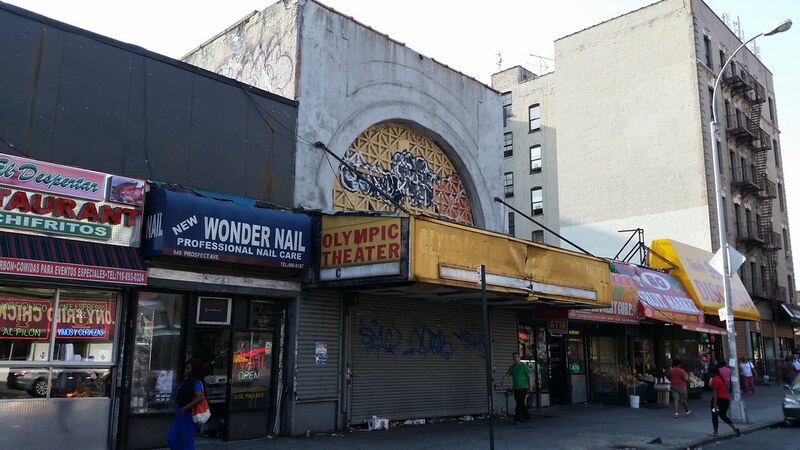 It sounds like the place survived until 1986 or so, and then was revived for a few years in the 21st century as the Olympic Theater Concert Hall, a live performance venue. Louis Lifschitz, a paper box manufacturer, of 874 Union Avenue, and his wife were about to enter the Prospect Theatre, at Prospect and Westchester Avenues, the Bronx, yesterday afternoon, when Mr. Lifschitz put his hand in his pocket and discovered he had been robbed of $265. Mrs. Lifschitz, on hearing the news promptly fainted. This was too much for Lifschitz. He gave one glance at his wife, and then fell in a faint beside her. The incident caused much excitement in front of the theatre, and policemen came running from all directions to quiet the throng. An ambulance was summoned from Lebanon Hospital, and Dr. Weinberg of that institution revived Mrs. Lifschitz and her husband. The two then proceeded to the Morrisania Police Station, where Lifschitz reported the robbery.